Green onions, also known as scallions, are young shoots of bulb onions with a milder flavor. Both the white base and the green leaves are edible. To prepare, remove excess skin and trim off the root end. Cut trimmed green onions crosswise into slices according to desired size for your recipe. They are frequently eaten raw in salads, salsas and dips and whole green onions can also be grilled or served raw on a relish tray. Finely minced green onions can be used as a substitute for fresh chives. When selecting green onions, look for bright green tops and firm white bottoms. 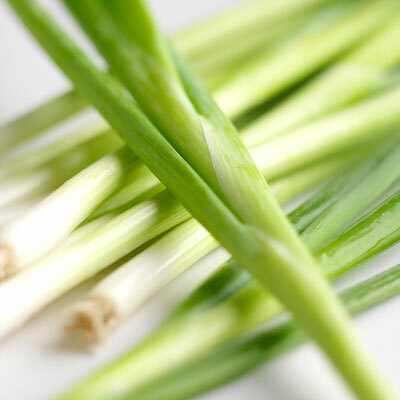 Green onions should be stored away from odor-sensitive foods, as they tend to absorb the odor of the onions. Remove any damaged leaves or rubber bands and store them in the refrigerator. Always wash fresh produce before consuming.